Foursquare is a location-based social networking application that is growing fast; US visits to Foursquare have rocketed by 50% in January compared to December alone (Experian Hitwise, 2010). So what’s it all about? You use the Foursquare app on your mobile phone to “Check-in” to different places – be it the gym, your work, your local grocers, an airport… basically anywhere. If Twitter answers the question “What are you doing?” then Foursquare answers “Where are you (doing it)?”. This information can also be linked to your Twitter and Facebook accounts to let the people in these networks know where you are. Or you can choose to limit this information just to your Foursquare network, should you not want to share this with your wider network. To encourage use, there is also a gaming element to Foursquare. As you check-in to more/different places you earn “Badges”. For example, on your first check-in you unlock a “Newbie” badge; and you unlock the “local” badge when you check-in to the same place three times in a week. Right now there are 32 badges that are available to unlock. Last, but not least, if you happen to be the person that has the most check-in’s to a particular location, then you earn the title of “Mayor” of that place. Of course you can be ousted as Mayor at any time, should someone else check in more times than you do. When this happens, you receive an Email to notify you of your ousting, and by whom. If you have Foursquare linked up to your Twitter account, then it will also send this out as a tweet. When I explained Foursquare to someone recently, it sounded really dumb, but it’s surprising how addictive and competitive it can get, especially as more people start to join up. So What are the Business Applications of Foursquare? Do you remember in the 90’s when loyalty cards first started to take off? Well, mayorships could be the new loyalty card in the making. 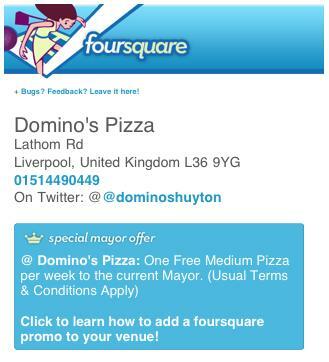 There are many examples of businesses who are starting to use Foursquare to reward such loyalty, including Mio Gelato in Portland, where the mayor gets a free coffee and gelato scoop; and Dominos Pizza Huyton in Liverpool where the mayor gets free pizza. Nom nom. Local businesses can encourage people to keep coming back by also rewarding them for their check-ins. For example, a reward may be given for a first check-in to an establishment, or for multiple, returning check-ins (such as five check-in’s in one month). It’s a good way to encourage people to keep coming back, especially when the prospect of becoming the mayor of a popular place is a difficult title to achieve. If a person checks-in to a place nearby your business, then Foursquare can flag “Nearby Special Offer” for your establishment. This is a great way to raise awareness of your presence, especially if you are a newer business that has just set up. It also helps to encourage people to come visit your store. 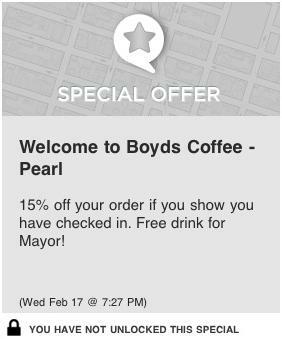 As an example Boyds Coffee in Portland flags a special 15% discount when you check-in nearby with Foursquare. Another nice thing about Foursquare is that people can leave tips (which serve as recommendations) for different places they have visited. People in their network will be able to see these tips and can add them to their “To-Do” list. Encouraging people to leave tips on their experiences can be a good way of gathering positive reviews, particularly when users have a good number of local connections. When it comes to enterprise or B2B companies, the application of Foursquare becomes a little less obvious. Most of the ones I am aware of revolve around things like events, exhibitions and conferences. In fact, Foursquare has the potential to work very nicely where event marketing is concerned. Check-ins could be used to help encourage booth traffic. Use the geo-location feature to add your booth location as a place on Foursquare and then encourage people to check-in, for example, to get entered into a free drawing. Another idea would be to offer a free giveaway to the first 20 check-ins at your booth. If people check-in to the conference center, or building in which the event is being hosted, then you can use the “Nearby Special Offer” feature to flag the special for your booth. Some companies have made good use of the gaming component of Foursquare to encourage people to check-in. For example, the CES Consumer Technology Trade Show developed their own special CES 2010 badge when visitors checked in to the Las Vegas Convention Center. 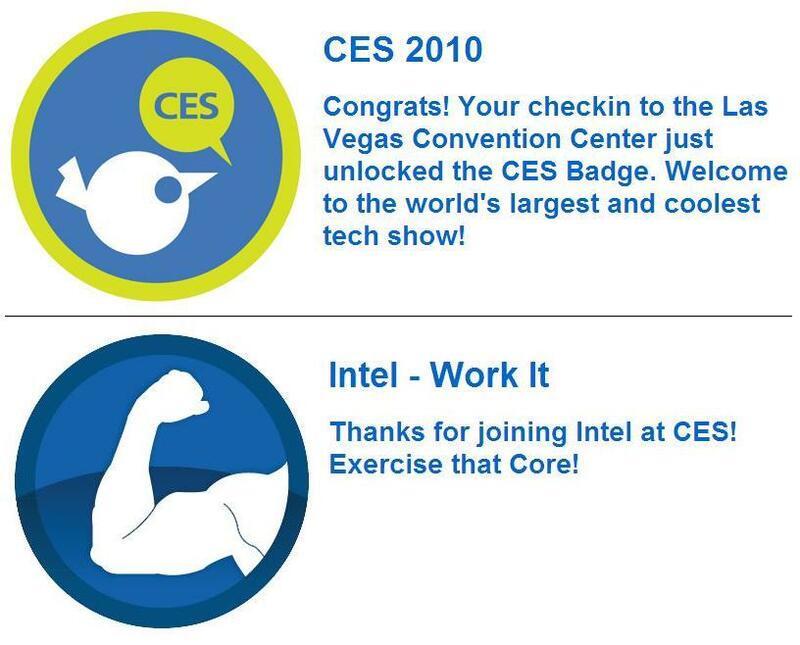 Intel also designed their own badge for CES visitors who came to see them. Large events like this are also good opportunities for people to unlock the Swarm badge (where 50+ people have checked in to the same venue). Please feel free to share any other ideas or business applications you have seen for Foursquare. How have your dealings with Foursquare been going? Do you have a good contact there in terms of implementing some of these ideas? Do you think they will start charging companies to run these types of promotions? Thanks Lisa. 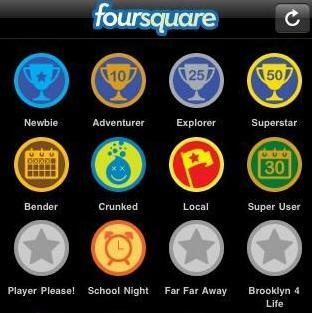 I’m definitely in Foursquare exploratory mode right now! I contacted them through their site to ask more about badges for events, but haven’t heard back yet. It will be interesting to see how and if the Foursquare peeps monetize specials and mayor deals. I think it will happen eventually, but it’s early days. TechCrunch wrote an interesting article a while back about this http://tcrn.ch/aGDtUL What do you think?